This study reveals the presence of black people in all walks of life all over the British Isles at the height of the imperialist era - challenging conventional views on imperialism, racism and British social history. Historians of British society have largely ignored this most visible of minorities, and commentators on racism have been silent on the period. Jeffrey Green has produced a fascinating account of the lives of dozen of black people born, resident or visiting Britain in the years between 1901-1914. Black and Asian Studies Association - "Jeffrey Green"s long awaited study of black people in Edwardian Britain is a most welcome publication….Certainly an essential purchase and hopefully the basis for much future research." Choice -"In this carefully researched monograph, Green rescues from obscurity the lives of a tiny but vibrant minority." Twentieth century British History- "This delightful and fascinating book makes an important historiographical point whilst establishing multiple agendas for further research…Black Edwardians begins decisively to fill in a large gap in our knowledge of Black Briton"s history- that of the period before the First World War. It joins a limited but growing number of book-length works presenting substantial amounts of evidence in the field…its methodological innovations point the way forward for other scholars"
International Journal of African Historical Studies -" The history of the African diaspora in Britain has long been a neglected area of research, although there has been some important scholarly work in recent years. Jeffrey Green"s long-awaited study of black people in Edwardian Britain is a most welcome publication and an important contribution to this growing body of work…Green"s study is based on a rich variety of sources and contains almost fifty photographs, many of them published for the first time. 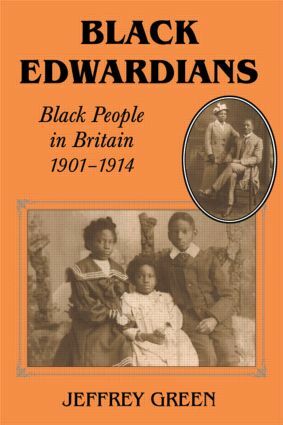 Black Edwardians is a fascinating book and will hopefully provide the basis for further research on this important but often neglected aspect of the history of the African diaspora." "a major contribution not only to black British history but also British history"